I just wanted to share a more detailed description of our recently funded project for prospective students and anyone else who is interested. This description is similar to NSF’s public abstracts, the first paragraph being for a general audience, and the second more technical for biologists. A key objective of the project is to create a lot of fun opportunities for students at all stages to get involved with Southwestern desert ecology. If you are one of those prospective students, please contact me! Understanding the basic biotic relationships and exchanges of energy and nutrients among desert organisms is important because drylands cover about 40% of Earth’s surface and play essential roles in global change phenomena such as rising atmospheric CO2, warming, and dust deposition. Recent evidence suggests that fungi play a critical role in supporting arid ecosystems. Fungi scavenge for nutrients and transport them throughout the soil using their filamentous root-like structures known as hyphae. Fungi may be especially important in areas with extensive biological soil crusts (biocrusts), which consist of surface-layer bacteria, fungi, lichens, and mosses. Biocrusts are common in drylands and confer benefits such as greater soil fertility (some are photosynthetic, turning atmospheric carbon into usable sugars and some can fix nitrogen from the air into forms usable by plants and other organisms) and stability, but how they interact with the dominant plants and how fungi mediate this interaction is not well resolved. This project explores the “fungal loop hypothesis,” which posits that fungal hyphae form a bridge between plants and biocrusts and transport resource such as water and nutrients between plant and biocrusts, conserving the scarce resources. While studies of fungal physiology, genetics, and nutrient cycling have provided support for the fungal loop hypothesis, no comprehensive studies have examined the importance of the fungal loop across multiple dryland sites. 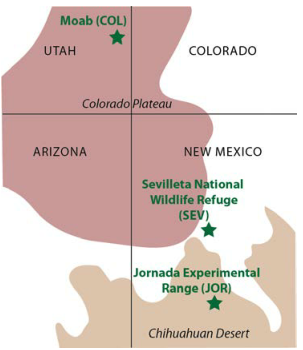 To test its importance, researchers on this project will study three different deserts: the Chihuahuan desert near El Paso, TX, the Colorado Plateau near Moab, UT and a site between those, the Sevilleta National Wildlife Refuge near Socorro, NM across three different years and two seasons. At these sites, they will quantify the movement of resources through fungal hyphae and develop a framework for understanding where and when the fungal loop is most important. If the broad importance of the fungal loop can be demonstrated, it will represent a fundamental difference between drylands and wetter environments, and lead to a new understanding of what drives ecosystem processes in drylands. The overall objective of this study is to test the fungal loop hypothesis by studying C and N translocation and retention across representative dryland sites. Using a set of field experiments at three sites, this project will address three questions: (1) How do translocation rates (i.e. transfer of C and N between plants and biocrusts through fungal hyphae) vary among dryland sites, plant and biocrust types, and seasons? (2) Does translocation improve growth, productivity and retention of C and N for plants and biocrusts? And (3) Are translocation rates determined by the stoichiometric requirements of plants and biocrusts? The proposed work will generate a predictive framework for when and where translocation of C and N between plants and biocrusts is greatest by examining translocation rates using isotopic tracers in sites across a latitudinal gradient with multiple biomes, a variety of plant and biocrust functional groups (eg. C3 and C4 grasses, forbs; light cyanobacterial vs. dark, multi-species communities) and different seasons (spring and monsoonal growing seasons). The work will also examine the importance of translocation by experimentally severing hyphal connections and measuring the effects on plant and biocrust performance as well as retention of C and N in the ecosystem. Finally, to address the mechanism of translocation, the investigators will test the hypothesis that stoichiometric gradients drive C and N movement through fungal hyphae (see figure above) by experimentally manipulating C and N gradients and observing the effects on the horizontal movement of C and N through the soil, also with the use of isotopic tracers. This research approach will allow for an unprecedented evaluation of the extent to which fungi are the key regulators of C and N cycling in dryland soils as suggested by the fungal loop hypothesis.